We reveal -- live from Las Vegas -- who YOU chose as the winner of the three-way build-off. Watch video from Chopper Live 2011. In this two-hour special, Senior, Junior and Jesse James compete in a no-holds-barred three-way build-off to determine whose bike reigns supreme. The winner -- determined by viewers, in a vote immediately following the show -- earns bragging rights as the best bike builder in the world. Watch video from The Build-Off. Dummies come to life, spitballs fly and air horns blast in this behind-the-scenes special. But what's a workplace without air-gun war, scooter jousting and helicopter drops? Watch video from Best Pranks. A three-way build-off is announced and contender Jesse James throws down the gauntlet by sending vulgar cakes to OCC and PJD. OCC works on two bikes and Junior unveils the biggest build of his career at Ground Zero in NYC. Watch video from Old Rivals. Junior lands the biggest job of his career when he is asked to build a bike inspired by the restoration of Ground Zero in NYC. Senior secures a build for a wealthy foreigner and rumors fly at both shops over Rick's assumed discontent at OCC. Watch video from Free Rick. Senior and Junior reveal their all-time favorite bikes, including OCC's St. Jude bike, PJD's first ever client build for Geico, and a shared favorite between father and son. Watch video from Top 10 Bikes. Mikey and Senior both say they want to meet up, but go back and forth about the conditions under which they will meet. Then, OCC works until the last second to complete their bike for US Biker Law.com, while PJD unveils their bike for Dekalb. Watch video from Communication Breakdown. In celebration of its 100th anniversary, Dekalb commissions a bike from PJD to be auctioned off with the proceeds going to benefit the American Red Cross. Meanwhile, OCC begins a build for Cell Buckle, a company that builds cell-phone holders for vehicles, to be unveiled at Sturgis. But when a dissatisfied Senior decides they must start from scratch, an offended Jason does the unthinkable. Watch video from Silent Treatment. In this special episode doors fly from hinges and windows are shattered as cast members recount the most heated moments over the past few years. The most memorable fights between father, sons and coworkers often begin with business but get personal. Watch video from Top 10 Fights. Deciding he'd like to commission painting, Senior continues to reach out to Mikey, who seeks counseling from Vinnie. In Atlanta, PJD reveals the bike for Cepheid, a medical technology company, to an impressed crowd, while in Indianapolis, OCC unveils the all-custom reverse trike for Beck's Hybrids as well as a bike to be used to raise money for the We Care for Orphans charity. Watch video from Mikey's Decision. Post-settlement, Senior tries to commission a painting from Mikey, but gets mixed signals from his son. OCC starts a build for Beck's, a family-owned hybrid-seed company that wants to build a reverse trike, while PJD works on a modern design for Cepheid, a medical diagnostics company. Watch video from Senior Reaches Out. OCC starts a build for WyoTech, a school for budding mechanics, while PJD continues work on their Gears of War 3 trike. Then, WyoTech students visit OCC to help out, while the understaffed PJD crew wonders how to find talented mechanics. Watch video from Gears of War. PJD works on a build for Gears of War 3, while the OCC crew builds a bike for Feather Free Zone. Meanwhile, with the OCC headquarters in foreclosure, Senior considers building a new shop at the front of his property or moving to the old OCC. Junior and Vinnie venture into "enemy territory" to pick up the Black Widow Bike, and Senior express his frustration that he hasn't seen Mikey post-settlement. PJD assembles the FIST Bike while OCC creates the Power Probe Bike. Watch video from Return of the Black Widow. Senior and Junior finally sit down to settle the two-year lawsuit that has torn their family apart. Amidst the drama, PJD starts a new bike for FIST Enterprises while OCC builds a rock-and-roll-inspired bike for Hard Rock. Watch video from The Settlement. OCC and PJD rush to finish their Cadillac bikes for the build-off, then race CTS-Vs at the Monticello Raceway. And at long last, Junior and Senior face each other when they unveil their bikes at General Motors. Watch video from Cadillac Build-Off Part II. Cadillac enlists both OCC and PJD to build a bike in a father-son build-off. But even as the competition heats up, Senior reaches out to Junior with a second settlement offer ... and this time, without lawyers. Watch video from Cadillac Build-Off Part I. The OCC crew heads up to Alaska to meet up with the Hillstrand brothers from Deadliest Catch. Then the Deadliest Catch Bike is built and unveiled at the CatchCon fan convention in Seattle. Watch video from Deadliest Catch Bike. As Senior makes an offer that he claims Junior rejected -- and Junior claims Senior took off the table -- both parties wonder whether the other really wants to move forward. PJD starts their charity-bike build for CrankyApe, one of two they are building for the company, while at OCC, the crew is underway with a triple bike build for Trans Am Depot. Then, Senior's dog dies and Junior reaches out to his father. Watch video from Offer Denied. Senior visits Mikey's gallery and is affected by paintings depicting their strained relationship. While both shops work on respective builds, Junior learns he has won his appeal of Senior's lawsuit, and Senior decides to make Junior a settlement offer. Watch video from Judgment Day. 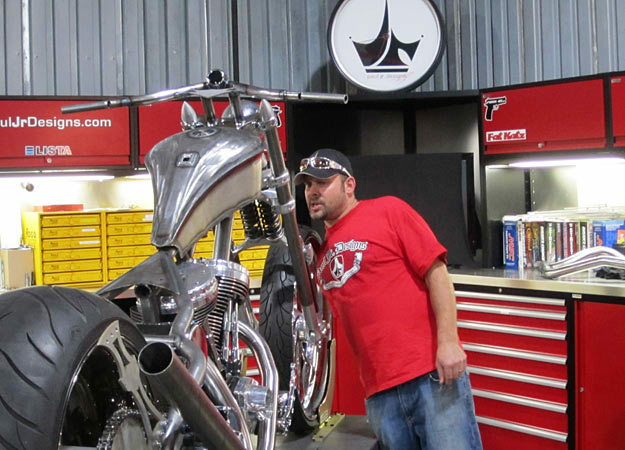 OCC builds a money-themed bike for longtime client Alan Brownfeld, while Junior and Mikey head to Louisiana to consult on a custom gun design with Will Hayden of Red Jacket Firearms and Sons of Guns. Then Senior announces his reconciliation with estranged son Dan, and Junior and PJD unveil their Jared Allen charity bike to a roaring crowd. Watch video from Big Guns. PJD starts on its first charity build -- for Jared Allen's Home for Wounded Warriors -- while OCC works on a custom build for Supernatural Cymbals. Then Junior meets with his lawyer to discuss the most recent lawsuit Senior has served him with, while Mikey gets a taste of the limelight at the opening of his Wolf Gang art gallery. Watch video from Mikey's Art Opening. Tensions are high at PJD as Junior fires Odie, who then turns to Senior for counsel, and hopefully, a job. PJD pulls off a double-unveil for Universal Property Insurance, while OCC unveils a bike to an enthusiastic crowd at BIC. Despite rumors that OCC is in foreclosure, the mood is celebratory as Senior unveils a bike for St. Jude Children's Hospital. Junior takes on Universal Property Insurance as a new client, but but tempers flare at PJD, with one employee at risk of losing his job. Lee drops in on OCC, seeking advice from Senior regarding his new business. Then OCC unveils its Headrush bike, while PJD debuts its top-secret FARO bike. Watch video from Lee Returns. Junior acquires a longtime OCC client for a PJD bike build, leading the OCC crew to speculate that Joe violated his non-compete contract. Senior confides in Rick about his frustrations over his failure to reunite with Mikey, despite his best efforts. But Mikey is frustrated with his father for attending Jason's wedding and not his own son's. Later, Junior and Mikey sit down with Iron Horse Magazine in rebuttal to Senior's earlier interview, while OCC unveils the Hair Club bike in front of a roaring crowd. Watch video from Invitation Accepted.